When Pretty Vulgar arrived at Sephora a few weeks ago, I was so excited for the beautiful packaging and I was hoping that the products themselves would perform just as beautifully. One product that caught my eye was the Stick to the Story Tinted Lip Balm ($24). I have about a million tinted lip balms (and most of them are far less expensive) but I will fully admit that I purchased this product for the packaging alone. Totally guilty! So let's take a look and see if the balm is as beautiful as the packaging! Stick To The Story Tinted Lip Balm provides your lips with intense hydration and a flirty hint of color. This lip-smoothing formula will give your lips long-lasting comfort and a healthy-looking, natural glow. The soft rosy color is an ideal everyday shade and compliments all skintones. Cruelty Free, Gluten Free. Made in the U.S.A. 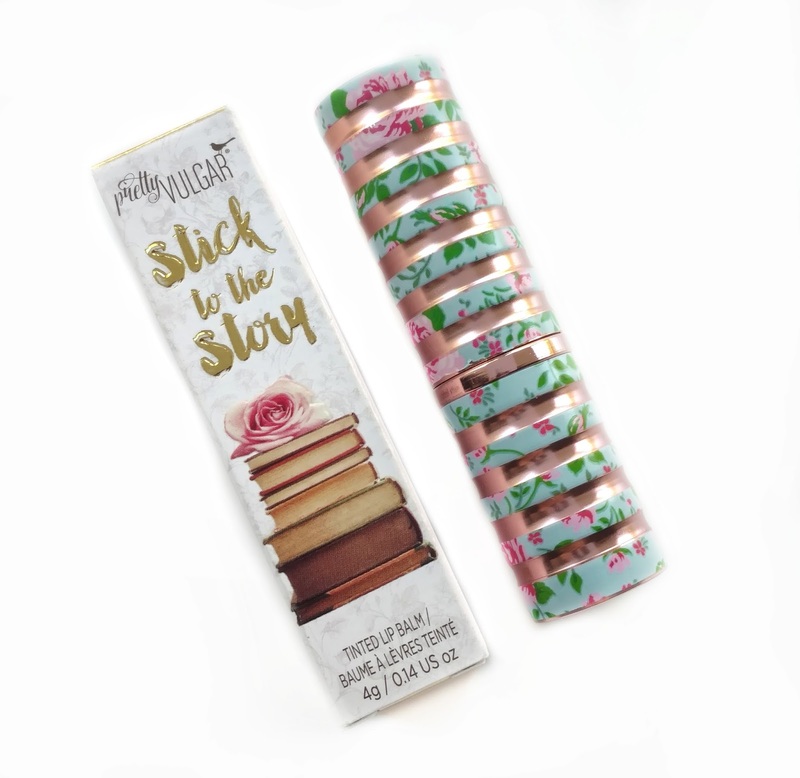 Stick to the Story comes in a beautiful ribbed tube with bands of rose gold alternating with bands of "Tiffany" blue and floral. The Pretty Vulgar logo is displayed on the top of the cap, as well as on the body of the tube when the cap is removed. The balm itself looks like it's going to be a deep pinky coral shade, as the bullet looks quite dark, but like most tinted balms it's very sheer. The color is that perfect "your lips but better" rosy shade and I think it'll look great on everyone. The formula feels wonderful on my dry lips. It's infused with Olive Oil, Virgin Coconut Oil, and Jojoba Oil, plus Shea Butter and Vitamin E, and it makes my lips look smoother, healthier, and less lined while I'm wearing it. Lasting power is decent for a tinted lip balm, but it does need to be reapplied several times throughout the day to refresh the color. I will say though...my lips continue to feel hydrated even after the color fades which isn't always the case when it comes to tinted balms. 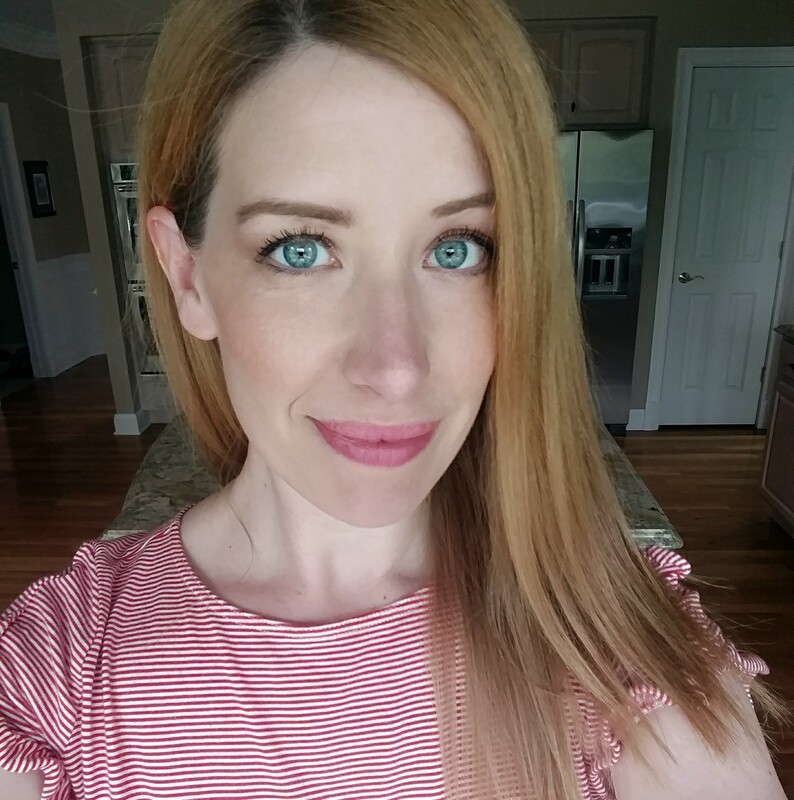 The color goes on sheer but you can actually get more color payoff if you layer it up a bit...I'm wearing it in the photo below. It's also worth mentioning that it does have a very faint citrusy scent that I only smell it if I stick my nose right up to the bullet. Overall, I'm really loving the Pretty Vulgar Stick to the Story Tinted Lip Balm, but is it worth $24? Probably not if you're just looking for a hydrating balm with a rosy tint...you can find those at the drugstore and they do a decent job for a lot less. 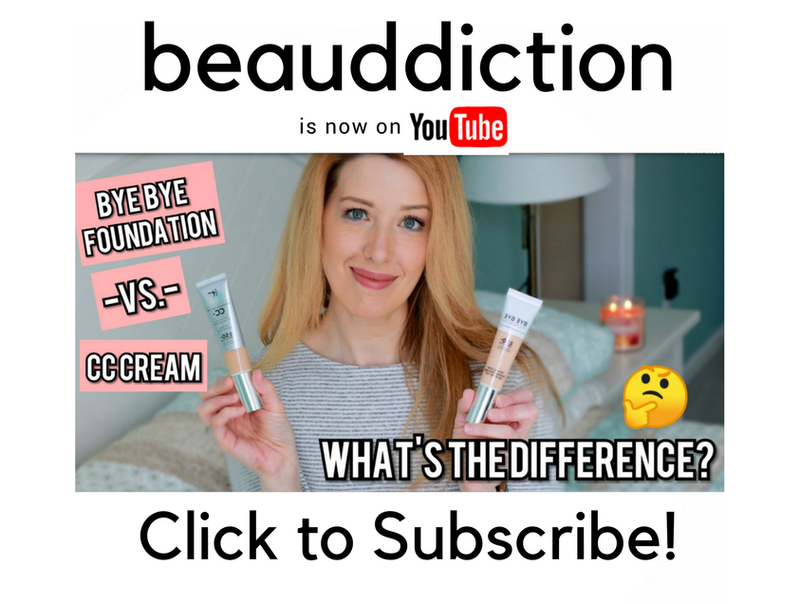 But I will say that this formula is particularly nice and a step up from drugstore options...I'm just not sure if it's $20+ better. Still, if you love and appreciate beautiful packaging you won't be disappointed with this one. I know I'll be using it right down to the end!